Manufactured By: Stony Plain Recording Company Inc. 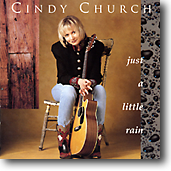 Released in 1995, Just a Little Rain delivers outstanding vocals and inspired writing creating a musical experience. Cindy would like to thank the musicians and writers for their inspiration and to Jamie Kidd for making this such a musical experience. The individual players contain the song above it – in the song’s entirety – for your enjoyment. Classifying the CD as "country" does not do it justice, although it is understandable that genre classifications on this site are arbitrary. Ms Church is a performer with a wide range: country, certainly, but also jazz, as in her Hoagy Carmichael collaborations with Joe Sealy in the past, and this CD covers the musical waterfront. What I find particularly affecting is her fresh interpretations of songs I thought I knew well. In particular, her take on Miss the Mississippi, Blue Eyes Crying and I wish You Love, opened those songs to me in a new and most moving way. The arrangements are spare and showcase her lovely voice.